FIGURE 1. Icteric pinna of a cat in the critical care isolation unit; prehepatic hemolysis and anemia are a result of Cytauxzoon felis infection. The objective of this article is to briefly review differentials for hyperbilirubinemia in the cat, and present a diagnostic and therapeutic strategy that will help practitioners approach this problem in an efficient and effective manner. Hyperbilirubinemia results when serum bilirubin concentrations reach 2 to 3 mg/dL (35–50 mcmol/L). The differentials for hyperbilirubinemia should be organized by location: prehepatic, hepatic, and posthepatic. While, in cats, it is common to find concurrent disease processes, starting from this foundation is the first step toward an effective and efficient diagnostic workup of icteric cats. Hemolysis releases hemoglobin, which is then metabolized through biliverdin to bilirubin in the liver. Hepatocytes in the healthy feline liver have a large capacity for uptake, conjugation, and excretion of bilirubin. Prehepatic icterus is most likely due to the combination of a large increase in bilirubin from hemolysis and a degree of intrahepatic cholestasis secondary to hypoxia.2 In dogs, the most common cause of prehepatic hyperbilirubinemia is immune-mediated hemolytic anemia (IMHA), but that condition appears to be quite rare in cats. The list of prehepatic causes of hyperbilirubinemia in cats is extensive (Table 1). Extrahepatic biliary disease interferes with the normal flow of bile and the final steps in bilirubin excretion, resulting in extrahepatic cholestasis (Table 1). As with intrahepatic disease, both unconjugated and conjugated bilirubin appear in the serum, rendering the biochemical distinction between conjugated and unconjugated serum bilirubin of minimal diagnostic importance. Infectious disease is a relatively common cause of prehepatic hemolysis in cats. Concurrent diseases, immunosuppression, and stress appear to impact the course and severity of disease and outcome of treatment. An eventual recurrence of disease is seen with some frequency in those cats that show a clinical response to treatment. Cytauxzoon felis is transmitted by ticks (Amblyomma americanum) and appears to be increasing in prevalence and geographical distribution in the United States, expanding from the southeastern portion of the country. Risk for infection increases with increased exposure to the tick vector, and the progression of clinical disease is rapid and often fatal. Erythrocyte pyruvate kinase (PK) deficiency is a very rare inherited disorder transmitted as an autosomal recessive trait, causing prehepatic hemolysis. Cats usually present as young adults, and the severity of the anemia and clinical signs is variable and may change over time, ranging from asymptomatic to hemolytic crisis. Hemolysis secondary to hypophosphatemia has become rare due to heightened awareness, diligent monitoring, and proactive intervention during the treatment of diabetic ketoacidosis. Disseminated intravascular coagulation is also a rare occurrence, seen predominantly in the critical care setting, but serving as a reminder that prehepatic hemolysis can occur as a secondary consequence in a variety of diseases. Feline erythrocytes are susceptible to oxidative stress, and a large variety of toxins and drugs (including acetaminophen, benzocaine, methylene blue, phenazopyridine, onions/onion powder, propylene glycol, and propylthiouracil) can cause Heinz body anemia or hemolytic destruction of RBC membranes. Hepatic lipidosis appears to be a unique feline phenomenon, highlighting that hepatic metabolism in the cat is different from many other species.10 Although feline hepatic lipidosis may be an idiopathic (Figure 2) and, therefore, primary problem, it quite frequently occurs secondary to another disease that caused the cat to stop eating. FIGURE 2. The liver (seen laparoscopically) of a cat with idiopathic hepatic lipidosis. Cholelithiasis may be obstructive and is, thus, approached as a cause of extrahepatic bile duct obstruction (EHBO). Other causes of EHBO include tumors, nonneoplastic masses, cholecystitis, inspissated bile, cholangitis, and pancreatitis. The prognosis, even following successful surgery, is guarded. Feline triaditis describes the concurrent conditions of cholangitis, pancreatitis, and inflammatory bowel disease in cats. There is a common outflow track for the feline pancreas and bile duct as they approach the major duodenal papilla. This anatomic association makes it likely that inflammatory disease or infection in one of these tissues impacts the health and function of the associated tissues. At this time it is unclear if the underlying etiology of triaditis is immune-mediated process, infectious, or multifactorial, making treatment decisions difficult. Significant local inflammation may create a functional EHBO that is not amenable to surgical removal, but must be addressed medically. Feline liver fluke infection is geographical and found in tropical environments, such as Florida, the Caribbean, and Hawaii, where land snails, lizards, and toads are the hosts. Infection is usually subclinical, although cats may present with nonspecific signs (Table 1). As with any diagnostic approach, the clinical evaluation of an icteric cat begins with signalment, history, and physical examination. The list of differentials for hyperbilirubinemia (Table 1) include breed-specific entries (eg, Abyssinian) and diseases that occur in certain age groups (eg, feline infectious peritonitis [FIP]). For many differentials the patient history is similar. Anorexia is a key component in the presentation of cats with hepatic lipidosis and appears to be an early clinical manifestation of anemia in cats. Lethargy can be difficult to appreciate in sedentary cats, and sick cats often hide, further delaying the owner’s observation of more obvious clinical signs. Dog owners may notice changes in the color of urine or feces, but it is much less likely for cat owners to report pigmenturia or acholic feces in this fastidious species. It is also relatively unusual for cats to have dietary indiscretion of toxins, household products, medications, or human food, but certainly the potential for exposure should be investigated during the anamnesis. The prevalence of multi-cat households also confounds the owner’s ability to appreciate changes in appetite, water consumption, or elimination habits. A complete physical examination, including body temperature, pulse, respiratory rate, fundic examination, cardiovascular auscultation, and abdominal palpation, is essential. Physical findings may indicate potential underlying etiologies, such as hepatomegaly with hepatic lipidosis, cranial abdominal discomfort with pancreatitis, and tachycardia with anemia. The physical examination is often dominated by the color of the cat. Icterus is best appreciated as a discoloration of the mucous membranes, the sclera (Figure 3), and/or the inner aspect of the pinnae (Figure 4). The intensity and actual color may be influenced by the normal tissue color, degree of anemia, and perfusion. The clinical condition and color of the cat are influenced by both the degree of anemia—mild to severe—and the time course of RBC destruction—acute or chronic. FIGURE 3. 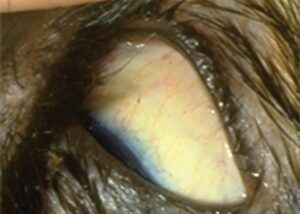 The sclera of the feline immune-mediated hemolytic anemia patient. FIGURE 4. The pinna of the feline immune-mediated hemolytic anemia patient. Greater than 12 mg/dL is associated with hepatic lipidosis and EHBO. The laboratory diagnostic workup for the vast majority of icteric cats starts with determining whether prehepatic hemolysis is present. Hemolysis can often be an extravascular antibody-mediated process in which the serum turns icteric. A simple hematocrit tube can be expected to identify a significant degree of anemia and a relatively normal serum total protein. Less frequently, the hemolysis occurs within the vasculature itself, in which case the serum may appear pink, while both the plasma (hemoglobinemia) and urine (hemoglobinuria) appear red. A complete blood count (CBC) more accurately and completely characterizes the anemia as regenerative or nonregenerative; however, the regenerative process may take up to 5 days to manifest as an appropriate increase in the absolute reticulocyte count (> 40,000–60,000/mcL, depending on the laboratory). A CBC also identifies other potentially important erythrocyte characteristics. The degree of anemia is cited as a nonspecific but general indictor of the likelihood that feline icterus is the result of prehepatic hemolysis. As a rule of thumb, prehepatic hemolysis usually results in a packed cell volume (PCV) of less than 13% to 20%; however, the cat’s baseline or normal PCV, hydration status, and the time frame over which the hemolysis occurred may all impact the clinical signs, measured PCV, and elevation in total bilirubin. Careful examination of the blood smear is a critical step in any attempt to identify infectious organisms or indicators of immune-mediated agglutination. 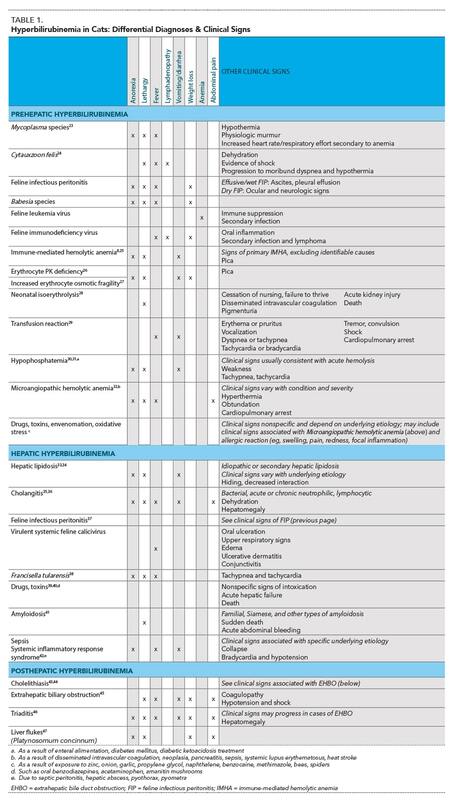 Infectious disease testing is commonly used for prehepatic hyperbilirubinemia (Table 2). In addition to hyperbilirubinemia, cats with mycoplasmosis are frequently hyperglobulinemic as a result of chronic immune stimulation, and they may have mild to moderate elevations in liver enzyme activity as a result of anemic—hypoxia-induced hepatocyte necrosis. There are a variety of technologies available to easily test for the FeLV p27 antigen, which is present in the majority of infected cats. Biochemical changes with Cytauxzoon felis are nonspecific, while anemia, pancytopenia, and thrombocytopenia may be seen on the CBC. Diagnosing IMHA using persistent RBC agglutination, a positive Coombs’ test, RBC characteristics, and reticulocytosis can be challenging in cats; other potential causes of prehepatic hemolysis must be carefully considered. Agglutination can be difficult to distinguish from normal rouleaux formation in the cat, but true RBC autoagglutination can be identified by mixing one drop of potassium ethylenediaminetetraacetic acid (K-EDTA) whole blood with 1 to 4 drops of 0.9% sodium chloride on a microscope slide. Macroscopic slide erythrocyte agglutination is seen in all IMHA cats, although it rarely persists following RBC washing. Biochemical and CBC parameters of cats with erythrocyte PK deficiency are nonspecific and inconsistent among patients, although hyperglobulinemia was frequently seen. Genetic testing and responsible breeding are clearly important considerations. Hepatic hyperbilirubinemia is caused by significant primary hepatic disease. A minimum diagnostic database includes a CBC, serum biochemical profile, urinalysis, and FeLV/FIV status. Once the cat is icteric, and prehepatic causes have been ruled out, the serum bilirubin is elevated to the point where a bile acids test for liver function is redundant; the results will be abnormal. With mild hyperbilirubinemia (< 2 mg/dL), a bile acids test may be warranted to assess liver function. Ultrasonographic imaging of the entire abdomen by a board-certified specialist is an essential step in the assessment of the feline hepatobiliary system. Ultrasound is a powerful tool for assessing the liver parenchyma, visualizing the biliary system, and searching for EHBO. Ultrasound-guided fine needle aspiration (FNA) is also a minimally invasive technique for acquiring samples of certain tissue, such as the liver, pancreas, and lymph nodes, and masses for cytology and culture. Coagulation parameters and clotting times should be determined prior to FNA. In cats that present with hepatic lipidosis, it is critical to put diagnostic effort into identifying the disease that led to the cat’s anorexia in the first place, whether that is as simple as dental disease or as complex as feline pancreatitis. 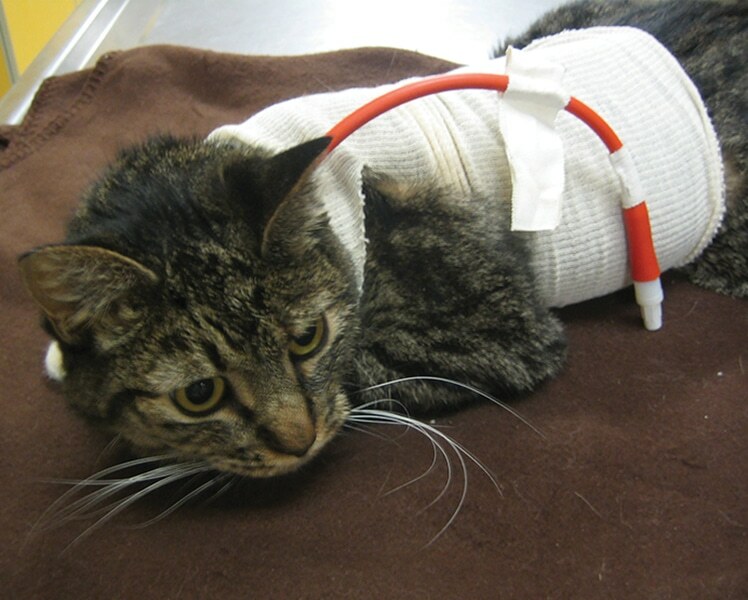 Failure to identify and address the concurrent condition is very likely to result in the cat being presented to the hospital again with the same complaint. The diagnostic effort of feline cholangitis is directed toward identification of the predominant inflammatory cell type present in the cat’s hepatobiliary system: acute neutrophilic, chronic neutrophilic, or lymphocytic. The most common infectious organisms found in patients with neutrophilic cholangitis are enteric bacteria (eg, E coli, Enterobacter, Clostridia) and antibiotics for treatment should be selected based on sensitivity. 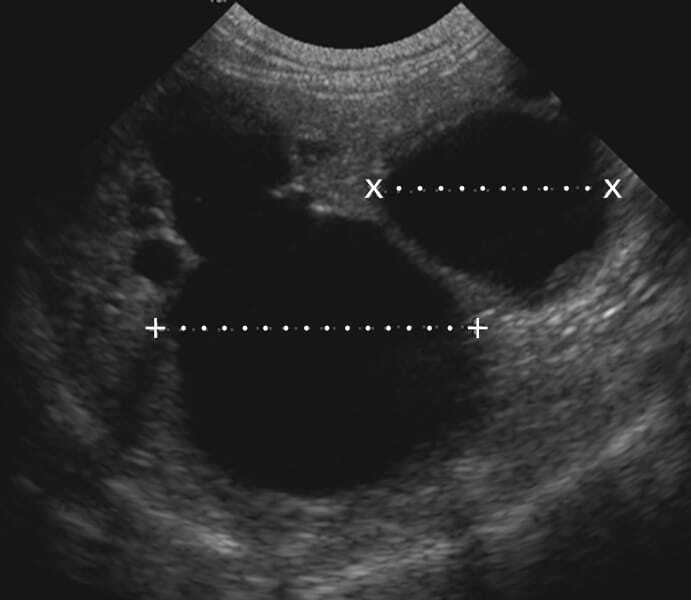 Abdominal ultrasound of cats with EHBO frequently identifies distension of the gallbladder, common bile duct, and intrahepatic ducts (Figure 5). FIGURE 5. Abdominal ultrasound demonstrating a distended gallbladder and enlarged biliary outflow tract in a cat with EHBO. Diagnosis of triaditis is based on identification of disease in each of the 3 tissues involved; the gold standard for diagnosis is histopathology. Less invasive diagnostics include the feline pancreatic lipase immunoreactivity (fPLI) blood test, abdominal ultrasound, liver FNA, cholecystocentesis, cytology, culture and sensitivity, and small intestinal endoscopic biopsy; however, these patients may have increased anesthetic risks. 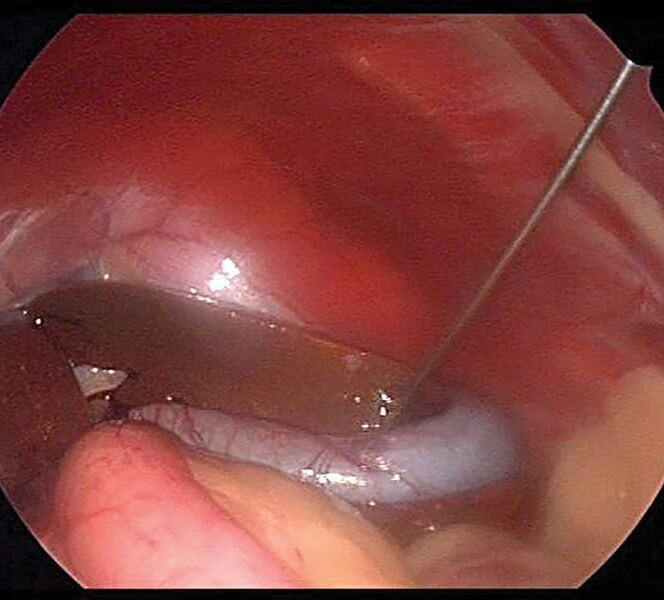 Although not widely available in private practice, feline abdominal laparoscopy can be performed with equipment sized for pediatrics and allows the collection of tissue for histopathology (liver and pancreas) as well as direct aspiration of the gallbladder (Figure 6). FIGURE 6. Laparoscopic-assisted aspiration of the gallbladder in an icteric cat. Detailed treatment protocols for specific differentials are beyond the scope of this article. 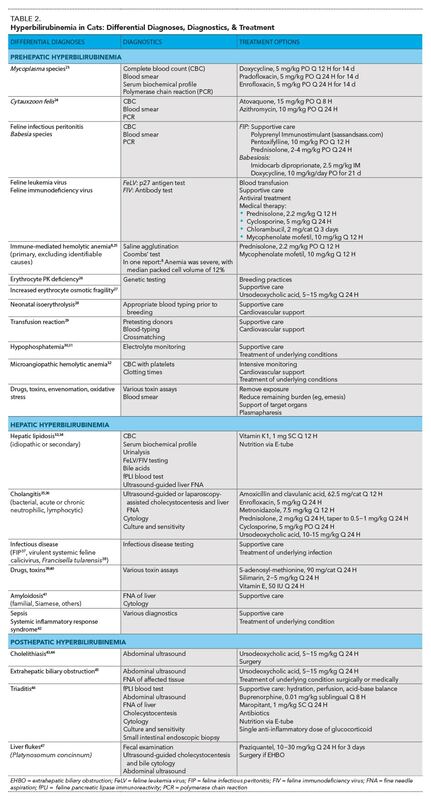 However, some selected therapies are described. Hydration status, pain (buprenorphine, 0.01 mg/kg sublingual Q 8 H), and vomiting (maropitant, 1 mg/kg SC Q 24 H) can all be addressed in a relatively effective manner and can significantly impact the clinical outcome. Adjunct therapy may include S-adenosyl-methionine (90 mg/cat Q 24 H), silimarin (2−5 mg/kg Q 24 H), and/or vitamin E (50 IU Q 24 H); however, there may be a limit to the number of medications an owner can administer to a cat. In addition to supportive care, including blood products, cats with IMHA appeared to respond to prednisolone therapy, although additional immunosuppressive drugs have also been used. Therapy for erythrocyte PK deficiency is supportive and nonspecific, and outcome depends, in large part, on the severity of presentation and use of transfusions to stabilize critical patients. Treatment of hepatic causes of hyperbilirubinemia is best guided by histopathology, when possible, or cytology and culture. The foundation of treatment for hepatic lipidosis is relatively simple: provide nutrition to the cat. The logistics may be challenging but the advent of esophagostomy tubes (E-tube) makes both nutrition and medication administration easier (Figure 7). Nutrition is critical; therefore, placement of an E-tube should be encouraged early in the disease process if the cat is anorectic. Vitamin K1 (1 mg SC Q 12 H) should be administered prior to E-tube placement if evidence of a coagulopathy is present. FIGURE 7. Icteric cat with IMHA ready for hospital discharge after placement of an esophagostomy feeding tube. Degenerative neutrophils with pleomorphic bacteria from the bile of an acutely ill cat is consistent with acute neutrophilic cholangitis (Figure 8), and treatment is initiated with 2 months of antibiotics aimed at enteric bacteria: cephalosporins, amoxicillin and clavulanic acid (62.5 mg/cat Q 12 H), enrofloxacin (5 mg/kg Q 24 H), and metronidazole (7.5 mg/kg Q 12 H). Lymphocytic cholangitis is believed to be immune-mediated, and treatment includes prednisolone with or without a period of concurrent antibiotics, although other immunosuppressive medications, such as cyclosporine, have been used in these patients. Posthepatic causes, such as EHBO, often require surgical intervention—laparotomy may be the only viable therapeutic option—and carry a poor prognosis. Nonsurgical causes, such as pancreatitis and cholangitis, are medically managed and the prognosis is impacted by the severity of disease, response to treatment, and owner commitment. The effective treatment of triaditis is complicated, but is initiated with supportive care targeting hydration, perfusion, electrolyte and acid–base balance, pain, and vomiting; then targets the aspect of the disease constellation that appears to be having the greatest impact on the patient. Antibiotics are administered in patients in which there is the potential for sepsis, gastrointestinal translocation, positive bacterial cultures, or a left shift with band neutrophils on the CBC. Corticosteroids are usually avoided in the face of a positively identified bacterial component, although a single anti-inflammatory dose of glucocorticoid may be used to counter the inflammatory mediators. Without strong evidence of a bacterial infection, corticosteroids are often used to treat each separate component of feline triaditis: inflammatory bowel disease, pancreatitis, and lymphocytic-plasmacytic cholangitis. Nutritional support in the form of E-tube placement is often implemented. Medical treatment for liver fluke infection may be attempted with praziquantel (20−30 mg/kg Q 24 H for 3 days), but rare, severe cases may require surgery to remove a posthepatic biliary obstruction as identified with abdominal ultrasound. A thoughtful approach to hyperbilirubinemia, starting with localization of the disease and including the calculated consideration of differentials unique to that location, greatly enhances the efficient and effective diagnosis and treatment of the “yellow cat.” Organizing the effort in terms of pre-hepatic, hepatic, and post-hepatic conditions is a logical and time-tested approach that has been successfully applied to many icteric cats. Sherding RG. Feline jaundice. J Fel Med Surg 2000; 2(3):165-169. Sherding RG. Icterus. In Washabau RJ, Day MJ (eds): Canine and Feline Gastroenterology. St. Louis: Elsevier, 2013, pp 140-147. Jenkins KS, Dittmer KE, Marschall JC, et al. Prevalence and risk factor analysis of feline haemoplasma infection in New Zealand domestic cats using a real-time PCR assay. J Feline Med Surg 2013; 15:1063-1069. Duarte A, Marques V, Correia JH, et al. Molecular detection of haemotropic Mycoplasma species in urban and rural cats from Portugal. J Feline Med Surg 2015;17:516-522. Walker VR, Morera GF, Gómez JM, et al. Prevalence, risk factor analysis, and hematological findings of hemoplasma infection in domestic cats from Valdivia, Southern Chile. Comp Immunol Microbiol Infect Dis 2016; 46:20-26. Hartmann K. Clinical aspects of feline retroviruses: A review. Viruses 2012; 4:2684-2710. Hartmann K, Addie D, Belák S, et al. Babesiosis in cats: ABCD guidelines on prevention and management. J Feline Med Surg 2013; 15(7):643-646. Kohn B, Weingart C, Eckmann V, et al. Primary immune-mediated hemolytic anemia in 19 cats: Diagnosis, therapy, and outcome (1998-2004). J Vet Intern Med 2006; 20(1):159-166. Grahn RA, Grahn JC, Penedo MC, et al. Erythrocyte pyruvate kinase deficiency mutation identified in multiple breeds of domestic cats. BMC Vet Res 2012; 8:207-217. Verbrugghe A, Bakovic M. Peculiarities of one-carbon metabolism in the strict carnivorous cat and the role in feline hepatic lipidosis. Nutrients 2013; 5:2811-2835. Van den Ingh TS, Van Winkle T, Cullen JM, et al. Morphological classification of parenchymal disorders of the canine and feline liver: 2. Hepatocellular death, hepatitis and cirrhosis. In Rothuizen J, Bunch SE, Charles JE, et al: WSAVA Standards for Clinical and Histological Diagnosis of Canine and Feline Liver Diseases. Philadelphia: Elsevier, 2006, pp 85-101. Wardrop KJ. Coombs’ testing and its diagnostic significance in dogs and cats. Vet Clin North Am Small Animal Pract 2012; 42:43-51. Wang KY, Panciera DL, Al Rukivat RK, et al. Accuracy of ultrasound-guided fine-needle aspiration of the liver and cytologic findings in dogs and cats: 97 cases (1990-2000). JAVMA 2004; 224(1):75-78. Wagner KA, Hartmann FA, Trepanier LA. Bacterial culture results from liver, gallbladder, or bile in 248 dogs and cats evaluated for hepatobiliary disease: 1998-2003. J Vet Intern Med 2007; 21:417-424. Peters LM, Glanemann B, Garden OA, et al. Cytological findings of 140 bile samples from dogs and cats and associated clinical pathological data. J Vet Intern Med 2016; 30:123-131. Rothuizen J, Twedt DC. Liver biopsy techniques. Vet Clin North Am Sm Anim Pract 2009; 39:469-480.8. Koster L, Shell L, Illanes O, et al. Percutaneous ultrasound-guided cholecystocentesis and bile analysis for detection of Platynosomum spp.-induced cholangitis in cats. J Vet Intern Med 2016; 30(3):787-793. Harvey AM, Holt PE, Barr FJ, et al. Treatment and long-term follow-up of extrahepatic biliary obstruction with bilirubin cholelithiasis in a Somali cat with pyruvate kinase deficiency. J Feline Med Surg 2007; 9(5):424-431. Black V, Adamantos S, Barfield D, et al. Feline non-regenerative immune-mediated anaemia: Features and outcome in 15 cases. J Feline Med Surg 2015; 26:1-6. Bacek LM, Macintire DK. Treatment of primary immune-mediated hemolytic anemia with mycophenolate mofetil in two cats. J Vet Emerg Crit Care 2011; 21:45-49. Hartmann K. Feline leukemia virus infection. In Greene CE. Infectious Diseases of the Dog and Cat, 3rd ed. Philadelphia: Saunders Elsevier, 2006, p 124. Otte CM, Penning LC, Rothuizen J, Favier RP. Retrospective comparison of prednisolone and ursodeoxycholic acid for the treatment of feline lymphocytic cholangitis. Vet J 2013; 195(2):205-209. Weingart C, Tasker S, Kohn B. Infection with haemoplasma species in 22 cats with anaemia. J Feline Med Surg 2016; 18(2):129-136. Sherrill MK, Cohn LA. Cytauxzoonosis: Diagnosis and treatment of an emerging disease. J Feline Med Surg 2015; 17(11):940-948. Bacek LM, Macintire DK. Treatment of primary immune-mediated hemolytic anemia with mycophenolate mofetil in two cats. J Vet Emerg Crit Care 2011; 21(1):45-49. Kohn B, Fumi C. Clinical course of pyruvate kinase deficiency in Abyssinian and Somali cats. J Feline Med Surg 2008; 10(2):145-153. Tritschler C, Mizukami K, Raj K, Giger U. Increased erythrocyte osmotic fragility in anemic domestic shorthair and purebred cats. J Feline Med Surg 2016; 18(6):462-470. Silvestre-Ferreira AC, Pastor J. Feline neonatal isoerythrolysis and the importance of feline blood types. Vet Med Int 2010; 2010:1-8. Tocci LJ. Transfusion medicine in small animal practice. Vet Clin North Am Small Anim Pract 2010; 40(30):485-494. Justin RB, Hohenhaus AE. Hypophosphatemia associated with enteral alimentation in cats. J Vet Intern Med 1995; 9(4):228-233. Adams LG, Hardy RM, Weiss DJ, Bartges JW. Hypophosphatemia and hemolytic anemia associated with diabetes mellitus and hepatic lipidosis in cats. J Vet Intern Med 1993; 7(5):266-271. Estrin MA, Wehausen CE, Jessen CR, Lee JA. Disseminated intravascular coagulation in cats. J Vet Intern Med 2006; 20(6):1334-1339. Armstrong PJ, Blanchard G. Hepatic lipidosis in cats. Vet Clin North Am Small Anim Pract 2009; 39(3):599-616. Center SA. Feline hepatic lipidosis. Vet Clin North Am Small Anim Pract 2005; 35(1):225-269. Brain PH, Barrs VR, Martin P, et al. Feline cholecystitis and acute neutrophilic cholangitis: Clinical findings, bacterial isolates and response to treatment in six cases. J Feline Med Surg 2006; 8(2):91-103. Callahan Clark JE, Haddad JL, Brown DC, et al. Feline cholangitis: A necropsy study of 44 cats (1986-2008). J Feline Med Surg 2011; 13(8):570-576. Pedersen NC. An update on feline infectious peritonitis: Diagnostics and therapeutics. Vet J 2014; 201(2):133-141. Pennisi MG, Egberink H, Hartmann K, et al. Francisella tularensis infection in cats: ABCD guidelines on prevention and management. J Feline Med Surg 2013; 15(7):585-587. Weingarten MA, Sande AA. Acute liver failure in dogs and cats. J Vet Emerg Crit Care 2015; 25(4):455-473. Park FM. 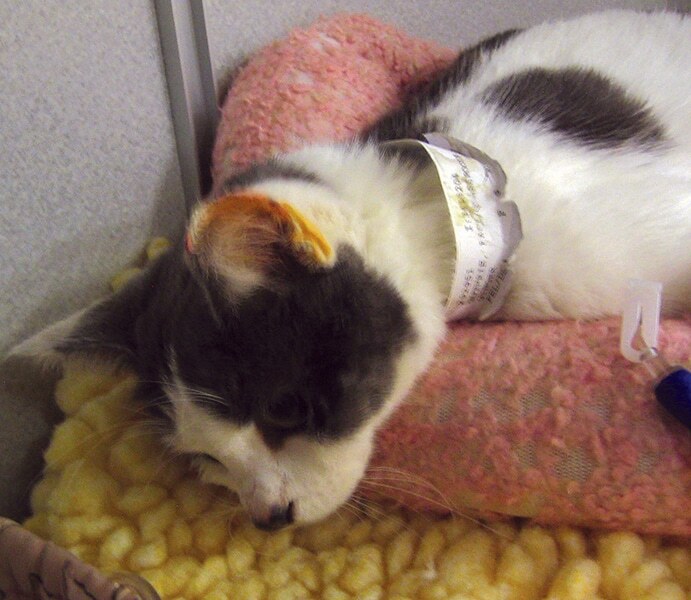 Successful treatment of hepatic failure secondary to diazepam administration in a cat. J Feline Med Surg 2012; 14(2):158-160. Beatty JA, Barrs VR, Martin PA, et al. Spontaneous hepatic rupture in six cats with systemic amyloidosis. J Small Anim Pract 2002; 43(8):355-363.
Cooper J, Webster CRL. Acute liver failure. Compend Contin Educ Pract Vet 2006; 28(7):498-515. Center SA. Diseases of the gallbladder and biliary tree. Vet Clin North Am Small Anim Pract 2009; 39(3):543-598. Eich CS, Ludwig LL. The surgical treatment of cholelithiasis in cats: a study of nine cases. JAAHA 2002; 38(3):290-296. Mayhew PD, Holt DE, McLear RC, Washabau RJ. Pathogenesis and outcome of extrahepatic biliary obstruction in cats. J Small Anim Pract 2002; 43(6):247-253. Simpson KW. Pancreatitis and triaditis in cats: Causes and treatment. J Small Anim Pract 2015; 56(1):40-49. Haney DR, Christiansen JS, Toll J. Severe cholestatic liver disease secondary to liver fluke (Platynosomum concinnum) infection in three cats. JAAHA 2006; 42(3):234-237. Craig B. Webb, PhD, DVM, Diplomate ACVIM (Small Animal Internal Medicine), is a professor in the clinical sciences department at Colorado State University (CSU) and head of the small animal medicine section. Dr. Webb specializes in gastroenterology and hepatology and, along with Drs. David Twedt and Eric Monnet, teaches the CSU CE Endoscopy & Laparoscopy course as well as the ACVIM Dry-Lab Laparoscopy course. Dr. Webb’s research interests include chronic enteropathies, oxidative stress, nutraceuticals, and the use of stem cell therapy in small animal patients. He received his DVM from the University of Wisconsin–Madison. This article is RACE-approved for 1 hour of continuing education credit. To receive credit, take the approved test online at vetmedteam.com/tvp.aspx (CE fee of $5/article). After reading this article clinicians should be able to differentiate the disease processes in cats with hyperbilirubinemia, formulate an efficient diagnostic path, and prepare an effective treatment protocol for these patients. This article provides an overview of the differentials for feline hyperbilirubinemia, a diagnostic plan for identifying the underlying etiology of the condition, and a number of therapeutic options for these patients. Questions online may differ from those here; answers are available once CE test is taken at vetmedteam.com/tvp.aspx. Tests are valid for 2 years from date of approval. True/False: Icterus is a sensitive marker of the cause of hyperbilirubinemia in cats. Locating the source of hyperbilirubinemia is an important diagnostic step. Which of the following is not normally a component of this localizing step? Which of the following is the first and most cost-effective step toward the diagnosis of prehepatic hemolysis? Which of the following is not considered a cause of hemolytic anemia in cats? Which of the following is the single most important component of the treatment plan for idiopathic hepatic lipidosis? Which of the following is not one of the WSAVA classifications of feline cholangitis? 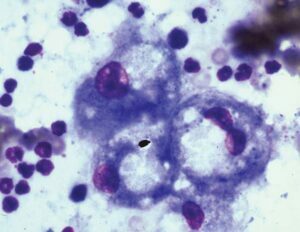 Cytology can be used to guide treatment in cases of feline cholangitis. If ultrasound-guided FNA of the liver revealed degenerative neutrophils with intracellular bacteria, the foundation of treatment would be which of the following? 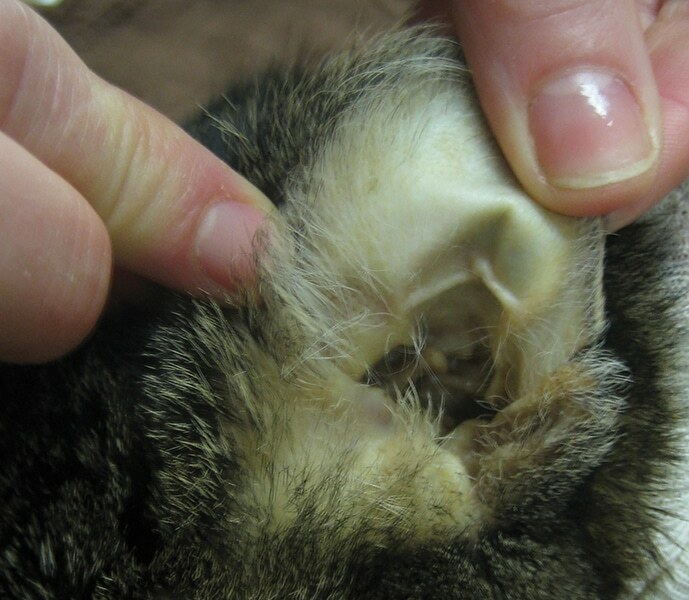 Which of the following is not considered a component of feline triaditis? Which of the following is the treatment of choice in a cat in which biliary choleliths are causing an extrahepatic biliary obstruction? Placement of an esophagostomy feeding tube allows the owner to administer which of the following to an icteric cat at home?